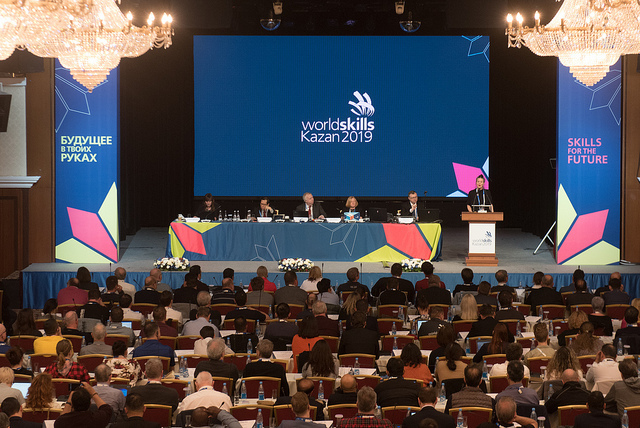 600 delegates from 60 WorldSkills Members meet in Kazan. A welcome to the 600 delegates from more than 60 Member countries and regions started the Opening Session by CEO of WorldSkills International David Hoey, Deputy Prime Minister - Minister of Education and Science of the Republic of Tatarstan Rafis Burganov, and Director General of the Young Professionals Union (WorldSkills Russia) Robert Urazov. 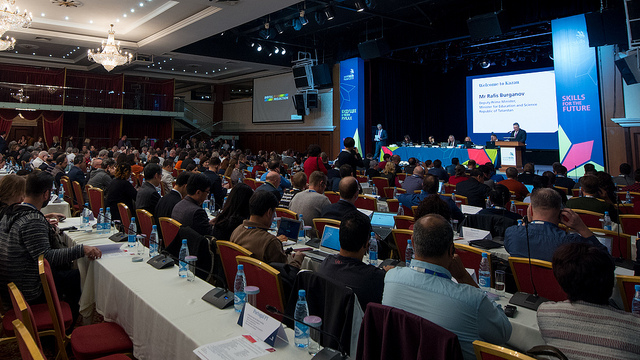 Before the beginning of the Opening Session, the WorldSkills Kazan 2019 Project Executive Emil Gubaydullin answered questions from journalists about the importance of Competition Preparation Week in preparation for the upcoming WorldSkills Competition. “Kazan Expo is a world-class facility, and we believe that the WorldSkills Competition will kick start the venue operation. We like this fantastic venue and very much looking forward to using it. One of the important tasks of Competition Preparation Week is to demonstrate the upcoming Competition Venue to the Experts,” said David Hoey. Competition Preparation Week attendees will have a very full schedule. They will visit the Competition Venue, Kazan Expo International Exhibition Centre, to get acquainted with the infrastructure and services. Their visit will include a trip to WorldSkills Village, official home of the Competitors and Experts during the event. On 24 January, the WorldSkills Organizing Committee led by the Deputy Prime Minister of the Russian Federation in charge of Social Policy Tatyana Golikova will be held. On 25 January, One School One Country will be launched. The goal of this programme is to promote skills to youth. WorldSkills Workshops will be conducted in educational institutions across Tatarstan. Representatives of the WorldSkills Champions Trust will take part in the week-long activities. Champions Trust representative from the Middle East, Gary Condon, is visiting Kazan for the first time. “I am very impressed. Kazan is very beautiful. I am excited about the start of the Competition!” he said. A confectioner from Russia and WorldSkills Brazil 2015 Competitor, Anna Prokopenya represents Europe at the WorldSkills Champions Trust. “It’s already the fourth year that I’ve become a member of the WorldSkills Champions Trust. I have been to Kazan many times. It has changed a lot and has become magnificent. I hope to feel proud of the image of my country inspiring our international friends during the Competition,” she said.